Paper Year tells the story of young newlyweds Dan Delaney (Avan Jogia) and Franny Winters (Eve Hewson) moving through their first year of marriage. 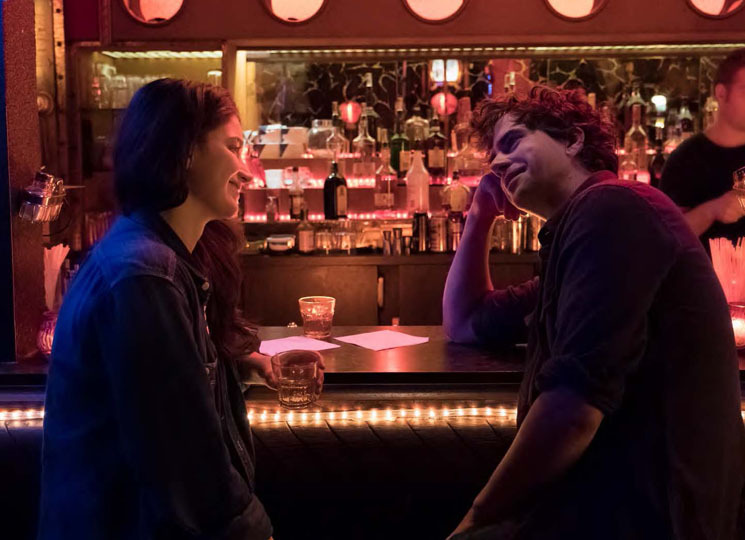 While it is Rebecca Addelman's feature directorial debut, as a writer for New Girl and Netflix's Love, the story of a goofy young couple struggling their way into adulthood is not new territory for her. Paper Year finds a charming balance between subtle humour and the couple's earnest efforts to maintain their relationship. The film begins with Dan and Franny, carefree and in love, getting a quick courtroom marriage. They are both unemployed, and clearly have other facets of adulthood to figure out in addition to their relationship. So when Dan, an out-of-work actor, tells Franny he got a real "adult person" job, it's clear she is a bit disappointed when it turns out to be dog-sitting in a successful actress's mansion. While Dan stays home with the dogs, Franny gets a job writing for Goosed, a TV game show, and channels more of her energy into succeeding professionally. The film is not exactly a comedy, but Dan and Franny's easy chemistry, the upbeat music, and the setting of a sunny Los Angeles mansion give the story a light-hearted tone. While it occasionally slips into feeling low-stakes, Addelman adds weight to it by sprinkling in darker, more awkward moments, such as Franny interacting with her creepy, entitled boss, who has a muted tantrum in his office when he sees her wedding ring. Even as relationship tensions mount, Paper Year maintains a restrained realism, instead of falling into over-the-top drama or rom-com cliches. Particularly striking is Franny's changing relationship with her coworker, Noah Barringer, who is older and also married. When Franny goes out for after-work drinks with Barringer, he tells her she is "adorable" and a "cutie-pie." Despite realizing he is being condescending, she still develops a crush on him. Perhaps because Addelman married and divorced at a young age herself, she resists reducing her characters to victims or villains, even when they make choices that might hurt their relationship. By grounding the story in complex, flawed characters, Paper Year achieves the difficult task of telling a sincere, thoughtful story without taking itself too seriously. Rebecca Addelman establishes herself as a deliberate, skilled director to keep an eye on.